In the presence of and in conversation with João Moreira Salles. This quote, borrowed from Werner Herzog, is at the heart of João Moreira Salles’ remarkable film Santiago (2007): a film that was shot in 1992 but was only completed thirteen years later. In 1992 Salles, a trained economist, had already directed several documentaries, after having been introduced to cinematic practice by his brother filmmaker Walter Salles. One day he decided to use the leftover film-stock from advertisements he used to produce with his brother to make a film about Santiago Badariotli Merlo, who had been his family's butler for over thirty years at their Gávea mansion in Rio de Janeiro. Now retired and living in a small apartment in the Leblon neighbourhood, Santiago appears to be the perfect documentary “character”: a flamboyant and picturesque man who recites poetry, plays castanets and piano, arranges flowers to perfection, and meticulously dedicates himself to documenting the lives of the world's aristocrats, for which he amassed more than 30,000 pages of notes. The five-day shoot generated about nine hours of material that Salles, however, abandoned in the editing process. “I tried to edit it but I couldn't do it”, he said later. “The film was to be all about Santiago as an exotic character ... a character that already existed before being filmed, I mean, he existed in my head more than anything.” When Salles returned to the footage thirteen years later, he did not return to finish the film he never completed, but to make a different film—a film that looks at his own blindness, how his desire to make a film obstructed his ability to see and how his own class privilege stood between him and his “character.” It is only by looking at the outtakes of the original footage, at those off-moments that would have ended up on the cutting room floor, that Salles is able to discover how the process of documenting leaves the filmmaker as caught on screen as his subject. Santiago’s telling subtitle: Uma reflexão sobre o material bruto, “A Reflection on Raw Footage”, can as well be applied to Salles’ latest film No Intenso Agora (2017), which he made following the discovery of images that document his mother’s trip to China in 1966—the year when Mao Zedong launched what became known as the Cultural Revolution. The elated expression he discerns on his mother’s face leads him towards an exploration of the fleeting nature of moments of great vitality, moments of living through an “intense now”. 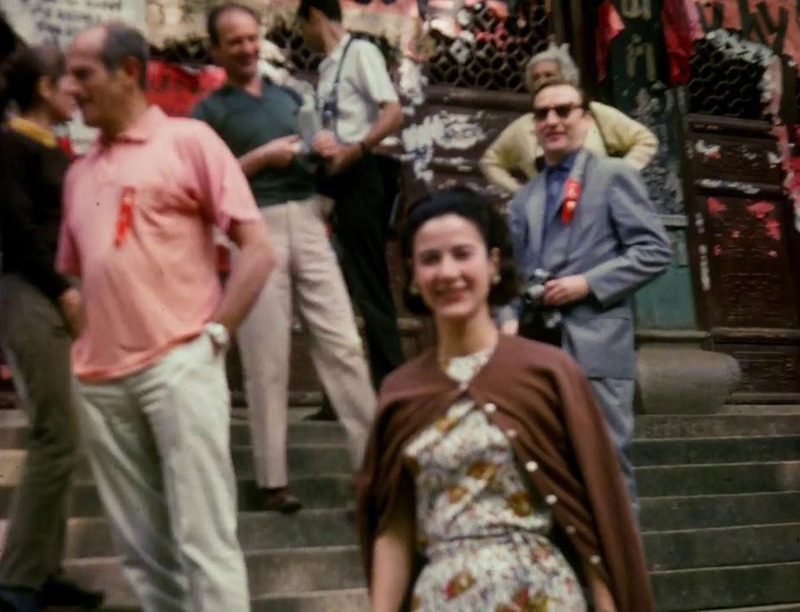 Scenes of China and Salles' own childhood in Brazil are set alongside footage showing the French students’ uprising in May of 1968 and the invasion of Czechoslovakia in August of the same year, when the forces of the Warsaw Pact put an end to the Prague Spring. What do these images of great personal and historical intensity, filmed inadvertently or purposefully, reveal of the state of mind of those filmed and those filming? What can one say of the shared experiences that unfolded in Paris, Prague, Rio de Janeiro, or Beijing by looking at the images of the period? Little by little, the film slides from questioning archival images to questioning the legend of May 1968 itself, in particular the roles played by rhetoric, performance and all kinds of “image-making”. But has the rebellious spirit of May 1968 only provided the dominant order with the means to renew itself, as many have come to argue, or can we also consider it as an interruptive force that continues to reverberate today? Now that the approaching 50th-anniversary of the events of May 1968 once again stirs up the longstanding debates on its influence and its legacy, No Intenso Agora encourages us to ask ourselves how its images can help us to surpass the sphere of disillusionment and disenchantment that has kept on lingering in its aftermath. A challenge that touches upon the core of João Moreira Salles’ cinematic research: to probe the mysterious inner life of filmed images. In addition to his work as a documentary filmmaker, Salles is founder of long-form journalism and culture magazine Piauí and president of the Instituto Moreira Salles, a center for photography, music, literature, iconography and cinema. His documentary films have garnered great recognition and awards at festivals like the Miami International Film Festival, the Cinéma du Réel, Havana Film Festival and others. Salles has also directed documentaries for television and lectured on documentary film at the Pontifical Catholic University of Rio de Janeiro and Princeton University. De vertoning wordt door STUK en Courtisane georganiseerd, i.s.m het Lieven Gevaert Centre en het Hoger Instituut voor Wijsbegeerte (KU Leuven) en maakt deel uit van DISSENT!, een initiatief van Courtisane, Auguste Orts en Argos. No Intenso Agora (The Intense Now) exploreert de revoluties van 1968 die zich over 4 verschillende landen en politieke werelden ontvouwen: Frankrijk, Tsjecho-Slowakije, China en Brazilië. De film, verteld vanuit het perspectief van de regisseur, reflecteert op wat zich onthult in opnames van het Franse studentenprotest in mei 1968; amateurbeelden gedraaid tijdens de invasie van Tsjecho-Slowakije in augustus van datzelfde jaar, toen troepen van de Sovjet-Unie een einde maakten aan de Praagse lente; de scènes die een toerist - de moeder van de regisseur - filmde in China in 1966, het jaar van de Culturele Revolutie, en opnames gemaakt tijdens Salles' eigen kindertijd in Brazilië, toen een repressieve militaire dictatuur werd gevestigd en het land bestuurde. Kunnen we deze kantelmomenten nog zien als een kracht die vandaag blijft nagalmen? De langdurige discussies over de invloed en het nalatenschap van de gebeurtenissen van mei 1968 worden aangewakkerd door de naderende 50ste verjaardag. In navolging daarvan moedigt No Intenso Agora ons aan ons af te vragen of deze beelden ons kunnen helpen om het hedendaagse gevoel van desillusie en ontgoocheling te overstijgen. Een uitdaging die de kern raakt van het cinematografische onderzoek dat João Moreira Salles voert: doordringen tot het mysterieuze innerlijke leven van gefilmde beelden.